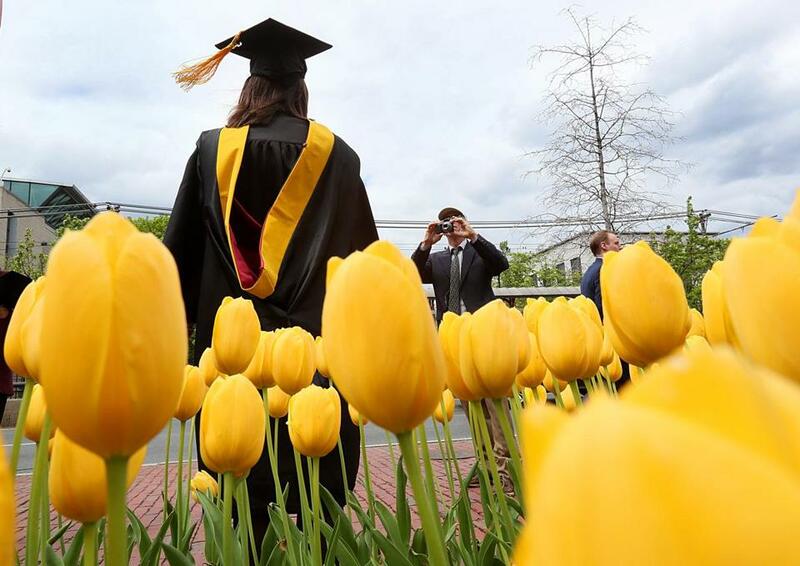 According to a new report by the Massachusetts Budget and Policy Center, more than half of the Bay State’s workforce has a bachelor’s degree, making it both the first state to reach the 50 percent threshold and the most educated state in the nation. In Massachusetts, a mecca of higher education, half of the workforce has a bachelor’s degree, making the state both the first to reach the 50 percent threshold and the most educated in the nation, according to a new report by the Massachusetts Budget and Policy Center. In 1979, just 20 percent of the state’s labor force had a bachelor’s degree or higher. Nationwide, just over a third of workers have four-year degrees. The state’s knowledge-based economy is creating more jobs that require bachelor’s degrees and driving more residents to obtain them. Yet as skyrocketing tuition costs hold many people back, the wage divide between the haves and have-nots has grown wider. In 1979, the median wage for a Massachusetts employee with a bachelor’s or higher was almost 50 percent higher than for someone who didn’t go to college. In 2016, residents with a college education earned nearly twice what workers without a degree make. Vicki Dzindzichashvili started college after she graduated from high school but couldn’t afford to continue, so she went to work for five years — first as a supervisor for a political fund-raising company, then as an administrative assistant at a law firm. Today, armed with a bachelor’s degree in management from the University of Massachusetts Boston, Dzindzichashvili, 29, works as an administrative manager at Harvard Medical School, overseeing a team of assistants who support the faculty and running a summer internship program. She makes three times what she did as a fund-raiser, and double what she made in subsequent jobs. And all she needed was that piece of paper. By 2020, almost three-quarters of jobs in Massachusetts will require postsecondary education, according to a 2013 Georgetown University study. And the cost of getting access to these jobs just keeps going up. The average cost of tuition and fees at state schools and community colleges in Massachusetts doubled between 2001 and 2016, according to the Massachusetts Budget and Policy Center, to $8,000 a year per student, adjusted for inflation, as state funding fell by $3,000 per student during the same period. At Carbonite, the Boston-based data backup company, most jobs require a bachelor’s degree, and chief executive Mohamad Ali admits that this filters out many smart, capable people who didn’t go to a four-year school. Like many local tech companies, Carbonite has struggled to fill jobs, and is working with an organization to tap into talent at community colleges and other educational institutions to get them into internships, and, ideally, full-time jobs. The intern who sits across the hall from Ali, Eddison Razon, a native of the Dominican Republic who just finished his associate’s degree at Bunker Hill Community College, landed an IT job at Carbonite through the program. The rapid rise in college-educated workers in Massachusetts, which had a greater increase in the share of college-educated workers than any other state between 1979 and 2016, also led to the state having one of the fastest-growing hourly median wages during that time. 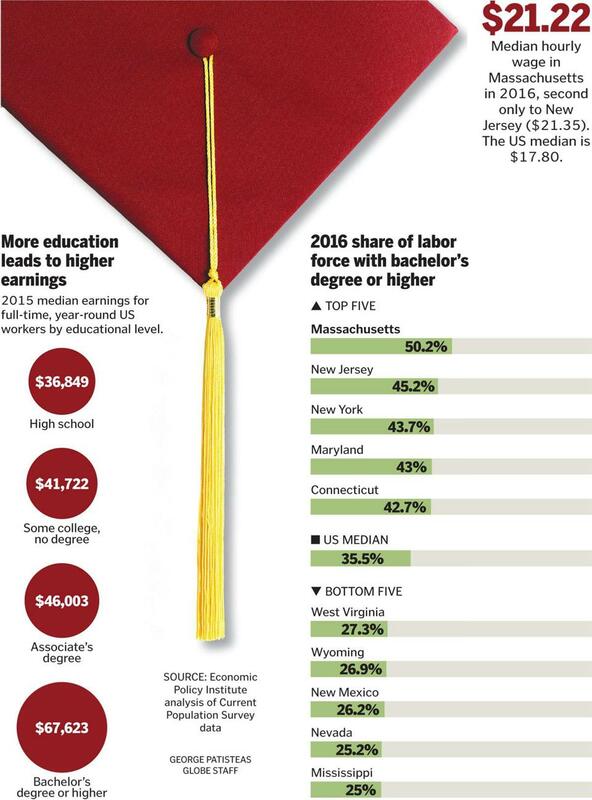 At $21.22 an hour, the Massachusetts median wage is below only that of New Jersey, where 45 percent of workers have bachelor’s degrees, the second most educated workforce in the country. Reflecting the patterns of income inequality across the nation, the wage gains over the years have been concentrated at the top. Wages for high school graduates and those with some college have remained flat since 1979, between $15 and $16 an hour, adjusted for inflation, while people with a bachelor’s degree or higher have had a 33 percent bump in wages during that time, to more than $30 an hour. Educated people in the top 10 percent of Massachusetts wage earners had the biggest gains, rising from a 52 percent premium to a 130 percent advantage over the highest paid 10 percent of workers with a high school diploma.